So… I have asked for you to send me your requests. If you are looking for a new project, why not let me do all the hard work for you? It makes for a great blog post that we can share with everyone and you get out of searching through endless patterns. I have finally gotten my first Craft Diva request! Okay, so maybe I kind of had to beg my friend to let me do the research for her but either way, I did. My friend, who was featured in my last post, is looking for a new pattern. 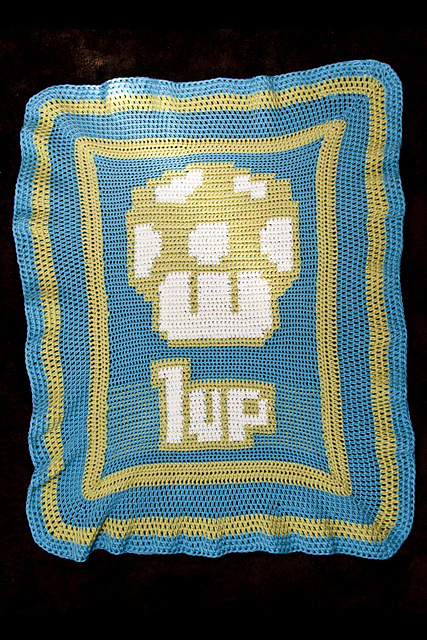 She made a fantastic Mario granny square blanket not too long ago and now it is time for a new project. I’ve scoured Ravelry for some unique and fun blanket patterns for her and YOU! Hopefully, I have made the choice a little easier for you and her by narrowing down the pattern choices to the more unique and child-friendly options. There are so many patterns out there to choose from and plenty are similar to each other but I have selected a few of varying skill range that seem to jump off the page for me. All of these patterns are available for FREE so please browse and choose as many as you like. Click the photo to be directed to the pattern link on Ravelry (you may need to sign up for a free account to get the pattern.). If you do decide to take on one of these beautiful blankets, please share! 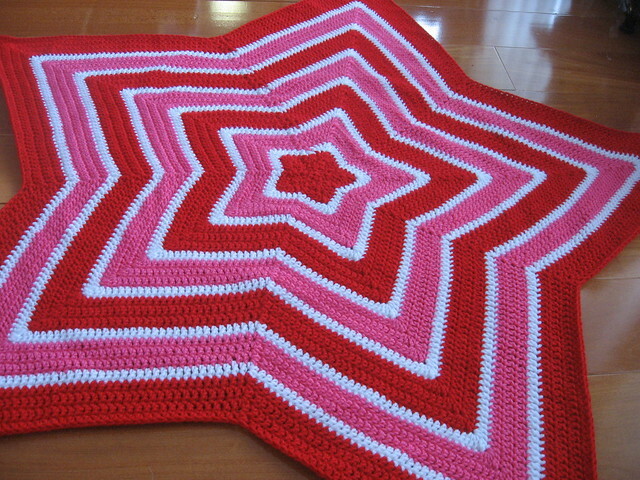 Try this pattern in a variety of colours for a boy or a girl! Amigurumi and blanket in one! Endless colour possibilities and super simple! How utterly adorable is this little fox? What about a life-sized sock monkey? This one may take a leap of faith but is VERY cool! This weekend, a friend of mine came to visit. She has recently taken up crochet and is a very talented and creative artist who works with many different media. Since I had a visitor, it seems fitting for the blog to have a visitor too! For those of you who are beginners at crochet or are debating trying it, I hope that this post will be inspirational to you. With little more than borrowed hooks and a passion for crafts, my friend has very quickly proven that crochet is an excellent outlet for creativity (not that this is of any debate). 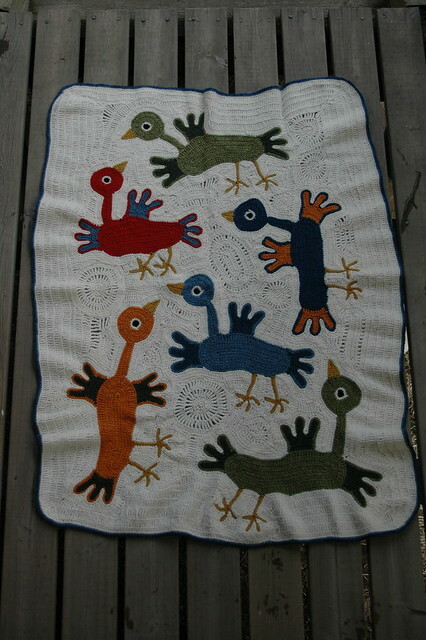 She excitedly texted me this photo of her very first blanket-in-the-works a little while back and I was blown away! Not only does this project fit with her personality seamlessly, but it is also an ambitious one. With more than 100 white granny squares alone to form the background, this is a very time consuming endeavor. She has since finished the blanket and it looks absolutely fabulous. A quick note; she ran into the same problem as I did when seaming her blanket. Beginning with horizontal rows and single crochet, she found that the number of single crochets were too few to allow for the full stretch of the granny square causing some bunching of the pattern. How nice it is to have friends to discuss this sort of thing! Below are a few more pictures of her “blankie”. She has also taken to creating some very adorable amigurumi stuffed animals and had a sweet little elephant named Frank, or “Fwang” as my 2 year old has taken to calling him, for us when she arrived. She documented her process very well too! The granny squares that make up Mario. Laid out and ready for seaming. All seamed up and ready for a border. Finished and relaxing on the couch. A little tail for Frank! Putting the pieces together to better see the final product. A pompom for a tail. If you would like your very own Frank, you can get the pattern here. You may notice that in the original pattern, he has no tail. He simply could not be an elephant with no tail so my friend improvised his sweet little tail by creating a short chain and single crocheting back on it once. Amigurumi animals are great personal gifts for anyone, not just children, so why not check out this page of free Ravelry patterns to see if you can find your own little friend to build! Or, if you like, here are a few of my faves: Baby Elmo, Alphabet Letters, Baby MONSTERS!, Little Owl… You can also click here for some YouTube tutorials on Amigurumi! Do you make Amigurumi? Tell us about your favorite pattern in the comments below!